This charm necklace with a round pendant is sure to dazzle. The 1.25″ diameter pendant is made of shiny aluminum and features a polished-scallop edge around the printed design. 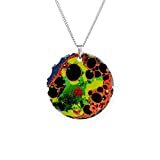 Each circle charm pendant comes with a quality 18″ brass necklace (electroplated with nickel-silver plating, finished with a non-tarnish overcoat gloss). Treat yourself, or make this charm necklace the perfect gift for Mother’s Day, Valentine’s day, or “just because.” IMPORTED.